This article is about the fort in Birgu, Malta. For other uses, see Castel Sant'Angelo (disambiguation). The site was occupied since pre-history and a prominent place of worship in antiquity with the building of the temple of Astarte. The date of its original construction is unknown. However, the prehistoric and classical remains on site, are indicative of a fortified place and a habitable zone. Large ashlar blocks and an Egyptian pink granite column at the top part of the fort still exists inside a chapel. The site was probably later developed by the Arabs c. 870 AD, but nothing is concrete. Al-Himyarī mentions that the Arabs dismantled a hisn (fortress), but there is no actual reference if this 'fortress' was in Birgu. A rock-cut church close to the area had already existed since Orthodox Christianity in Malta around 600 A.D. and was rebuilt with wood in around 800 A.D.
Its probable start as a fortification is the high/late medieval period. In fact, in 1220 Hohenstaufen Emperor Frederick II started to appoint his own Castellani for Malta who needed a place to live and secure the interests of the crown. The remains of a tower that may date back to the 12th century can be traced among the more recent works. The first mention of Castrum Maris ("Castle by the sea") is to be found in documents from the 1240s when Paulinus of Malta was the lord of the island and later when Giliberto Abate made a census of the islands. Another reference to the castle is that from the short Angevin rule (1266–83) where documents list it again as Castrum Maris and list a garrison of 150 men together with several weapons. It seems also that by 1274, the castle already had two chapels which are still there today. From the same year exists also a detailed inventory of weapons and supplies in the castle. From 1283 the Maltese islands were under Aragonese rule (although the castle withstood for some time in Angevin rule while the rest of Malta was already in Aragonese hands) and the fortification was mainly used by Castellani (like the de Nava family) who were there to safeguard the interests of the Aragonese crown. In fact the Castellans did not have any jurisdiction outside the ditch of the fort. By 1445 a Mariam confraternity, one of the eldest in Maltese history, had its convent located at the site. When the Order of Saint John arrived in Malta in 1530, they chose to settle in Birgu, when it was observed the site of Fort St Angelo was partially abandoned and in ruins. After renovation it became the seat of the Grand Master, which included the refurbishing of the Castellan's House and St. Anne's Chapel. The Knights made this their primary fortification and substantially reinforced and remodelled it, including the cutting of the dry ditch to make it a moat and the D'Homedes Bastion built by 1536. By 1547, a large cavalier designed by Antonio Ferramolino was built behind the D'Homedes Bastion, and De Guirial Battery was built at the tip of the fort by sea level to protect the entrance to Dockyard Creek. These works transformed the fort into a gunpowder fortification. Fort St Angelo withstood the Turks during the Great Siege of Malta, during which it succeeded in tearing apart a sea attack by the Turks on Senglea on 15 August 1565. In the aftermath of that siege, the Knights built the fortified city of Valletta on Mount Sciberras on the other side of the Grand Harbour, and the administrative centre for the knights moved there. In 1644, Giovanni de’ Medici proposed a new fort be constructed on Orsi Point (the site where Fort Ricasoli was later built), and the name and garrison of Fort St. Angelo be transferred to the new fort. He drew up plans for the proposed fort, but they were never implemented. It was not until the 1690s that the fort again underwent major repairs. Today's layout of the fort is attributed to these works which were designed by Carlos de Grunenbergh, who also paid for the construction of four gun batteries on the side of the fort facing the entrance to Grand Harbour. As a result, one can still see his coat of arms above the main gate of the fort. By the arrival of the French in 1798, therefore, the fort became a very powerful fortification including some 80 guns, 48 of which pointed towards the entrance of the port. During the short two-year period of French occupation, the Fort served as headquarters of the French Army. With the coming of the British to Malta the fort retained its importance as a military installation, first in use by the Army as a Wireless Station. In fact, in 1800, two battalions of the 35th Regiment were resident in the fort. However, at the start of the 20th century, the fort was taken over by the Navy and it was commissioned as a stone frigate, originally in 1912 as HMS Egmont, when it became a base for the Royal Navy in the Mediterranean, but in 1933 renamed as HMS St Angelo. The British did not make any major modifications to the fort, although they converted No. 2 Battery into a casemated battery for three nine-inch RML guns in the 1860s, and built a cinema and a water distillation plant in the early 20th century. During World War II, the fort again stood for siege with an armament of 3 Bofors guns (manned by the Royal Marines and later by the Royal Malta Artillery). In total, the fort suffered 69 direct hits between 1940 and 1943. When the Royal Navy left Malta in 1979 the Fort was handed to the Maltese government and since then parts of the fort have fallen into a state of disrepair, mostly after a project to transform it into a hotel during the 1980s. On 5 December 1998, a treaty was signed between Malta and the Sovereign Military Order of Malta granting the upper part of Fort St Angelo, including the Grand Master's House and the Chapel of St Anne, to the Order with limited extraterritoriality. Its stated purpose is "to give the Order the opportunity to be better enabled to carry out its humanitarian activities as Knights Hospitallers from Saint Angelo, as well as to better define the legal status of Saint Angelo subject to the sovereignty of Malta over it". This treaty was ratified on 1 November 2001. The agreement has a duration of 99 years but the document allows the Maltese Government terminate it at any time after 50 years. In terms of the agreement, the flag of Malta is to be flown together with the flag of the Order in a prominent position over Saint Angelo. No asylum may be granted by the Order and generally the Maltese courts have full jurisdiction and Maltese law shall apply. A number of immunities and privileges are mentioned in the second bilateral treaty. Other parts of the fort are leased to the Cottonera Waterfront Group, a private consortium. On 5 March 2012, it was confirmed that the European Regional Development Fund allocated €13.4 million for the restoration, conservation and re-use of the site, allowing for the Fort to be opened as a major visitor attraction highlighting its history and roles through the ages as well as to cater for educational programs, cultural events and live historical experiences. The restoration was managed by Heritage Malta. and completed in September 2015. It frequently participates in hosting events of national importance including the Commonwealth Heads of Government Meeting 2015  and the 2017 Maltese EU presidency. View of Fort St. Angelo, with the four batteries constructed by Grunenburgh visible to the left. Upon the arrival of the Order in 1530, the Castrum Maris consisted of a shell keep containing various buildings, including the Castellan's house and the Chapel of St. Mary (later rededicated to St. Anne), and an outer ward. The castle also included a chapel dedicated to St. Angelo, which was later rededicated to the Nativity of Our Lady. D'Homedes Bastion – built during the reign of Juan de Homedes y Coscon. It was heavily altered since the 16th century, especially when it was converted into a gunpowder magazine. Part of the bastion was destroyed in World War II, but the damage was repaired in the 1990s. Ferramolino's Cavalier – a high cavalier near D'Homedes Bastion, built between 1542 and 1547. Its roof had eight embrasures, and several magazines and a beacon were also located on the cavalier. De Guiral Battery – a small sea-level battery on the western side of the fort. It was named after Francesco de Guiral, its commander during the Great Siege. The battery was altered in the 17th and 18th centuries, and again by the British. Most of the present configuration of the fort dates back to reconstruction in the 1690s. Among the features added Grunenbergh, there were four batteries facing the entrance to the Grand Harbour. No. 1, No. 2 and No. 4 Batteries were heavily altered by the British, while No. 3 Battery retains more of its original features. However, their remains were relocated to the crypt of St. John's Co-Cathedral in the late 16th century. The fort is supposedly haunted by the Grey Lady, a mistress of the Castellan De Nava family. The story goes that she protested at not having the same status as De Nava's wife, and fearing that the affair would become public, he ordered his guards to get rid of her. The guards killed her and sealed her body in the fort's dungeon. Upon hearing that the guards had killed her and not sent her away, De Nava ordered them to be killed as well. The ghost of the Grey Lady was first seen in the early 1900s, and she was vulgar and aggressive. An exorcism then took place, and the Grey Lady was not seen again for a number of years. Her ghost appeared again during World War II, when she supposedly saved some soldiers' lives from aerial bombardment. According to popular belief, a sealed passage was opened and the skeletons of the Grey Lady and the two guards were found within. This discovery is not recorded in any official records. According to some fishermen, the fort is also haunted by Ottoman soldiers executed during the Great Siege of 1565. ^ a b "Interview: Fort St Angelo - Bringing An icon back to life". The Malta Independent. 12 March 2012. Retrieved 16 July 2015. ^ "Knights' Fortifications around the Harbours of Malta". UNESCO Tentative List. Retrieved 15 July 2015. ^ "A hand book, or guide, for strangers visiting Malta", p. 81. ^ [verification needed] Luttrell, Anthony (1970). "The House of Aragon and Malta: 1282-1412" (PDF). Journal of the Faculty of Arts. 4 (2): 156–168. ^ Spiteri, Stephen C. (26 July 2010). "Fort St Angelo during the Great Siege". MilitaryArchitecture.com. Retrieved 16 September 2014. ^ Blouet, Brian W. (October 1964). "Town Planning in Malta, 1530-1798". Town Planning Review. Liverpool University Press. 35 (3): 183. doi:10.3828/tpr.35.3.383v818680j843v8. ^ Quintano, Anton. "Fortifications: Fort Ricasoli". Heritage: An encyclopedia of Maltese culture and civilization. Midsea Books Ltd. 4: 1101–1107. ^ "Fort St Angelo". Lonely Planet. Retrieved 16 September 2014. ^ "Agreement between the Government of Malta and the Government of the Sovereign Hospitalier Order of Saint John of Jerusalem, of Rhodes and of Malta for the restoration and utilisation of parts of Fort St. Angelo". Ministry of Foreign Affairs. Archived from the original on 19 November 2014. Retrieved 16 September 2014. ^ "The Order and its Institutions - Mission". Sovereign Military Order of Malta. Retrieved 26 December 2011. ^ "After two centuries, the Order of Malta flag flies over Fort St. Angelo, beside the Maltese flag". Sovereign Military Order of Malta. 13 March 2001. Archived from the original on 20 October 2013. Retrieved 16 September 2014. ^ "Heritage Malta wants to transform Fort St Angelo into a cultural experience". Times of Malta. 3 September 2010. Retrieved 30 July 2011. ^ "Restoration of Fort St Angelo underway". Military Architecture. 8 September 2010. Retrieved 16 September 2014. ^ "Funds available at last for Fort St Angelo restoration". Times of Malta. 5 March 2012. Retrieved 5 March 2012. ^ "Progress being made in Fort St Angelo restoration". Times of Malta. 2 April 2013. Retrieved 16 September 2014. ^ Micallef, Mario (20 September 2015). "Fort St Angelo restoration completed". TVM. Archived from the original on 14 February 2016. ^ "UN chief to attend CHOGM". Times of Malta. 28 September 2015. Retrieved 29 September 2015. ^ Scerri, John. "Birgu". Malta-Canada.com. Retrieved 27 June 2015. ^ "D'Homedes Bastion – Fort St Angelo" (PDF). National Inventory of the Cultural Property of the Maltese Islands. 28 June 2013. Retrieved 13 July 2015. ^ a b "De Guiral Battery spared a restaurant". MilitaryArchitecture.com. Retrieved 27 June 2015. ^ "Cavalier – Fort St Angelo" (PDF). National Inventory of the Cultural Property of the Maltese Islands. 28 June 2013. Retrieved 13 July 2015. ^ "De Guiral Battery – Fort St Angelo" (PDF). National Inventory of the Cultural Property of the Maltese Islands. 28 June 2013. Retrieved 13 July 2015. 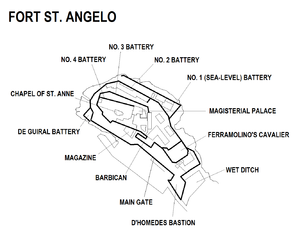 ^ "Sea-level (no1 ) battery – Fort St Angelo" (PDF). National Inventory of the Cultural Property of the Maltese Islands. 28 June 2013. Retrieved 13 July 2015. ^ "No. 2. Battery – Fort St Angelo" (PDF). National Inventory of the Cultural Property of the Maltese Islands. 28 June 2013. Retrieved 13 July 2015. ^ "No. 3 Battery – Fort St Angelo" (PDF). National Inventory of the Cultural Property of the Maltese Islands. 28 June 2013. Retrieved 13 July 2015. ^ "No. 4 Battery – Fort St Angelo" (PDF). National Inventory of the Cultural Property of the Maltese Islands. 28 June 2013. Retrieved 13 July 2015. ^ Mallia-Milanes, Victor (2008). The Military Orders: History and heritage. Aldershot: Ashgate Publishing Limited. p. 62. ISBN 9780754662907. Retrieved 31 October 2014. ^ "Malta's most haunted". Times of Malta. 16 March 2009. Retrieved 24 June 2015. ^ a b Frendo, Daniela. "The Grey Lady". Vox Humana. Retrieved 27 June 2015. ^ "Lady Of The Castle – True Ghost Story". The Horror Movies Blog. Retrieved 27 June 2015. Wikimedia Commons has media related to Fort St. Angelo. This page was last edited on 31 March 2019, at 08:28 (UTC).